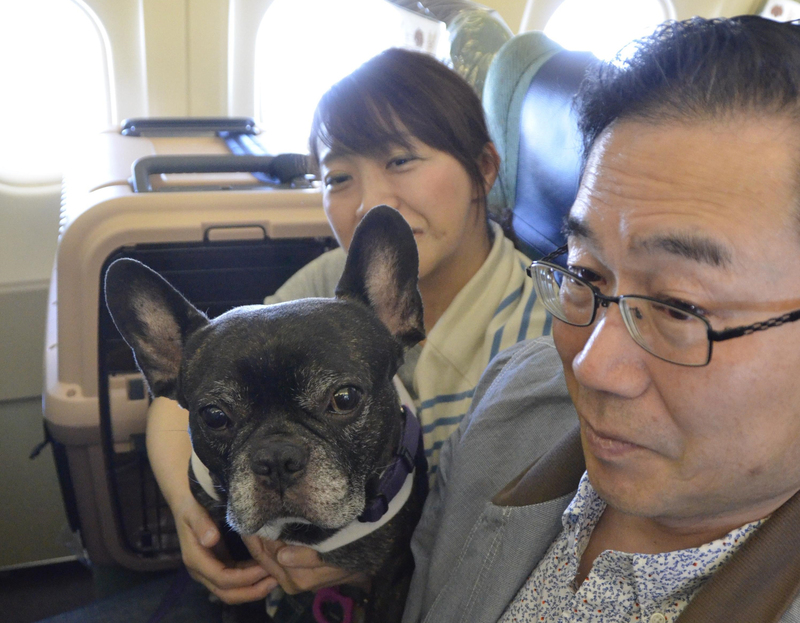 CHIBA - All Nippon Airways Co. is considering launching tours that allow pet dogs to travel in the cabin with their owners. ANA was inspired by the success of a trial charter it conducted in late May. 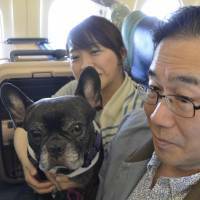 The package tour saw 87 passengers fly with their 44 dogs from Narita airport to Kushiro, Hokkaido, for a two-night stay. The basic package cost about ¥220,000 for two adults and a dog. Demand was so great that the flight sold out in just two days. A housewife in her 50s from the city of Chiba was among the participants, taking the tour with her husband and their 10-year-old dog. “In the past, we couldn’t make long-distance trips together,” she said. During the flight, the dogs were kept in cages fastened to window seats. A veterinarian accompanied the tour. Airline rules for domestic passengers traveling with pets require that pets be stowed in the cargo hold during the flight. However, pet owners have expressed concern that temperatures in the cargo area may affect their animals. Some airlines acknowledge the stress this can cause. In summer, ANA suspends carrying short-nosed dogs such as bulldogs and chins, as they are particularly susceptible to heat stroke or respiratory difficulties. Katsuhiko Shoji, professor of international tourism at Toyo University and head of a nationwide association that promoted tours with pets, welcomed ANA’s latest move. He said many customers want to make long-distance trips with their pets. ANA used to allow pets in the cabin on international flights but discontinued the service in 2005 after complaints from passengers who expressed discomfort around animals or suffered from allergies. The carrier discovered another potential problem: passengers not wanting to board an aircraft that has carried pets in the past, as some described their feelings about the plane used in May. An ANA official said if the airline launches pet flights on a regular basis, it will do more to inform customers about how cabins are cleaned. The tourism industry has high hopes for growth in tours with pets. “If long-distance travel becomes easier for them, Japan’s tourism industry will be revitalized,” Shoji said. But he noted, it is essential to get cooperation from hotels and the leisure industry in general. Pet travel packages will likely increase if the transport is available, said an official at a major travel agency.